For other people named Jack Welch, see Jack Welch (disambiguation). John Francis "Jack" Welch Jr. (born November 19, 1935) is an American business executive, author, and chemical engineer. He was chairman and CEO of General Electric between 1981 and 2001. During his tenure at GE, the company's value rose 4,000%. In 2006, Welch's net worth was estimated at $720 million. When he retired from GE he received a severance payment of $417 million, the largest such payment in history. Jack Welch was born in Peabody, Massachusetts, the son of Grace (Andrews), a homemaker, and John Francis Welch, Sr, a Boston & Maine Railroad conductor. Welch is Irish American and Roman Catholic. His paternal and maternal grandparents were Irish. Throughout his early life in middle school and high school, Welch found work in the summers as a golf caddie, newspaper delivery boy, shoe salesman, and drill press operator. Welch attended Salem High School, where he participated in baseball, football, and captained the hockey team. Late in his senior year, Welch was accepted to University of Massachusetts Amherst, where he studied chemical engineering. Welch worked in chemical engineering at Sunoco and PPG Industries during his college summers. In his sophomore year, he became a member of the Phi Sigma Kappa fraternity. Welch graduated in 1957 with a Bachelor of Science degree in chemical engineering, turning down offers from several companies in order to attend graduate school at the University of Illinois at Urbana-Champaign. He graduated from the University of Illinois, in 1960, with a masters and a PhD in chemical engineering. Welch joined General Electric in 1960. He worked as a junior chemical engineer in Pittsfield, Massachusetts, at a salary of $10,500. In 1961, Welch planned to quit his job as junior engineer because he was dissatisfied with the raise offered to him and was unhappy with the bureaucracy he observed at GE. Welch was persuaded to remain at GE by Reuben Gutoff, an executive at the company, who promised him that he would help create the small-company atmosphere Welch desired. In 1963, an explosion at the factory which was under his management blew off the roof of the facilities, and he was almost fired for that episode. By 1968, Welch became the vice president and head of GE's plastics division, which at the time was a $26 million operation for GE. Welch oversaw production as well as the marketing for the GE-developed plastics Lexan and Noryl. Not long after, in 1971, Welch also became the vice president of GE's metallurgical and chemical divisions. By 1973, Welch was named the head of strategic planning for GE and he held that position until 1979, which involved him now working from the corporate headquarters, exposing him to many of the "big fish" he would one day be among. Not long after his promotion to head of strategic planning, Welch was named senior vice president and head of Consumer Products and Services Division in 1977, a position he held until 1979 when he became the vice chairman of GE. In 1981, Welch became GE's youngest chairman and CEO, succeeding Reginald H. Jones. By 1982, Welch had dismantled much of the earlier management put together by Jones with aggressive simplification and consolidation. One of his primary leadership directives was that GE had to be No. 1 or No. 2 in the industries it participated in. Through the 1980s, Welch sought to streamline GE. In 1981, he made a speech in New York City called "Growing fast in a slow-growth economy". Under Welch's leadership, GE increased market value from $12 billion in 1981 to $410 billion when he retired, making 600 acquisitions while shifting into emerging markets. Welch pioneered a policy of informality at the work place, allowing all employees to have a small business experience at a large corporation. Welch worked to eradicate perceived inefficiency by trimming inventories and dismantling the bureaucracy that had almost led him to leave GE in the past. He closed factories, reduced pay rolls and cut lackluster units. Welch valued surprise and made unexpected visits to GE's plants and offices. Welch popularized so-called "rank and yank" policies used now by other corporate entities. Each year, Welch would fire the bottom 10% of his managers, regardless of absolute performance. He earned a reputation for brutal candor. He rewarded those in the top 20% with bonuses and stock options. He also broadened the stock options program at GE, extending availability from top executives to nearly one third of all employees. Welch is also known for abolishing the nine-layer management hierarchy and bringing a sense of informality to the company. During the early 1980s he was dubbed "Neutron Jack" (in reference to the neutron bomb) for eliminating employees while leaving buildings intact. In Jack: Straight From The Gut, Welch states that GE had 411,000 employees at the end of 1980, and 299,000 at the end of 1985. Of the 112,000 who left the payroll, 37,000 were in businesses that GE sold, and 81,000 were reduced in continuing businesses. In return, GE had increased its market capital tremendously. Welch reduced basic research, and closed or sold off businesses that were under-performing. In 1986, GE acquired RCA. RCA's corporate headquarters were located in Rockefeller Center; Welch subsequently took up an office in the now GE Building at 30 Rockefeller Plaza. The RCA acquisition resulted in GE selling off RCA properties to other companies and keeping NBC as part of the GE portfolio of businesses. During the 1990s, Welch shifted GE's business from manufacturing to financial services through numerous acquisitions. Welch adopted Motorola's Six Sigma quality program in late 1995. In 1980, the year before Welch became CEO, GE recorded revenues of roughly $26.8 billion and in 2000, the year before he left, they were nearly $130 billion. By 1999 he was named "Manager of the Century" by Fortune magazine. Embedding succession planning and employee development is important since the departures of management can have significant consequences on an organization. This decision will have paramount effects on future activities. Welch was passionate in making people GE's core competency. There was a lengthy and publicized succession planning saga prior to his retirement among James McNerney, Robert Nardelli, and Jeffrey Immelt, with Immelt eventually selected to succeed Welch as chairman and CEO. His successor plan has always been a priority, as noted in his 1991 speech "From now on, [choosing my successor] is the most important decision I'll make. It occupies a considerable amount of thought almost every day." Nardelli became the CEO of Home Depot until his resignation in early 2007, and until recently, was the CEO of Chrysler, while McNerney became CEO of 3M until he left that post to serve in the same capacity at Boeing. Welch's "walk-away" package from GE was not valued at the time of his retirement, but GMI Ratings estimates its worth at $420 million. He served as Chairman of The Business Council in 1991 and 1992. Upon his retirement from GE, Welch had stated that his effectiveness as its CEO for two decades would be measured by the company's performance for a comparable period under his successors. Welch had grown GE to over $450 billion in market capitalization, of which about 40% was in financial services. Twenty years later, the company's market capitalization was only $200 billion, and Welch refused to discuss its decline, other than noting much of the decline had resulted from investments in real estate, and that his immediate, handpicked successor, Jeff Immelt had to deal with the aftereffects of the September 11, 2001 terrorist attack. The New York Times wrote a critical article in 2017, noting GE's stock price as overvalued under Welch because of the growth of the financial services sector, as well as described the amalgamated corporation's decline in 16 years under Immelt, who likewise was one of the country's highest-paid managers and eventually sold off two of Welch's largest acquisitions, NBC Universal and GE Capital. According to BusinessWeek in 1998, Welch's critics questioned whether the short-term performance pressure he placed on employees may have led them to "cut corners", thus contributing to subsequent scandals over defense-contracting, and/or the Kidder, Peabody & Co. bond-trading scheme in the early 1990s. The following year, CEO Welch took issue with reclassification of GE in the Fortune 500 as a "diversified financial services company" rather than an "electrical equipment company," and by 2005 many had noted that the price-earnings ratios of the financial services sector were lower than that for GE. In 2014, GE Capital (the company's major financial services branch organized during Welch's tenure) agreed to the largest credit card discrimination settlement in history, concerning many years of deceptive marketing as well as discriminatory credit practices. After Welch's tenure, GE Capital had been labeled as "too big to fail" and had become regulated by the Federal Reserve. The retired Welch publicly praised his former firm's "slim-down" and return to being an industrial company. In 2018 Welch discussed the different financial culture in Kidder Peabody, whose acquisition he arranged during his tenure at GE, and whose ethos was based on short term bonus calculations. Shortly before the settlement was announced, GE Capital renamed itself as Synchrony Bank; the spin-off took two years. Welch also often received criticism for a lack of compassion for the middle class and working class. When asked about excessive CEO pay compared to ordinary workers (including backdating stock options, golden parachutes for nonperformance, and extravagant retirement packages), Welch labeled such "outrageous" allegations and vehemently opposed proposed SEC regulations affecting executive compensation. Countering the public uproar, Welch declared that CEO compensation should continue to be dictated by the "free market," without interference from government or other outside parties. One admirer believed Welch's acquisitions and wholesale shutdowns of GE business units Welch "proved" that keeping only the "good" units of a company can maximize ROI in the short term. Welch's income and assets came under particular scrutiny during his divorce from his second wife, Jane Welch, in 2001, for adultery with the woman who became his third wife. Court filings during the divorce described Welch's GE compensation, which led to a Securities and Exchange Commission investigation of the then-retired Welch's employment contracts with GE. In 1996, Welch and GE had agreed to a "retention package" worth $2.5 million, and which promised continued access after Welch's retirement to benefits he had received as CEO—including an apartment in New York, baseball tickets and the use of a private jet and chauffeured car. Welch stated that he did not want more money, nor a more traditional stock package, but instead preferred to retain the lifestyle he had enjoyed as GE's CEO. According to a 2008 interview with Welch, he had filed the agreement with the SEC, and addressed the media attention and accusations of being "greedy" by renouncing those benefits. In 2012, Welch and his third wife, Suzy Welch, quit their business associations with Fortune magazine and Reuters news service after Fortune published an article which criticized Welch's tweet shortly before the 2012 election that alleged the Obama administration manipulated certain economic statistics, as well as another article which elucidated the 100,000 jobs GE lost during his tenure as CEO. Following Welch's retirement from General Electric, he became an adviser to private equity firm Clayton, Dubilier & Rice and to the chief executive of IAC, Barry Diller. In addition to his consulting and advisory roles, Welch has been active on the public speaking circuit and co-wrote a popular column for BusinessWeek with his wife, Suzy, for four years until November 2009. The column was syndicated by The New York Times. In September 2004, the Central Intelligence Agency published a parody of Welch applying his management skills while serving as imagined Deputy Director of Intelligence. In 2005, he published Winning, a book about management co-written with Suzy Welch, which reached No. 1 on The Wall Street Journal bestseller list, and appeared on New York Times Best Seller list. On January 25, 2006, Welch gave his name to Sacred Heart University's College of Business, which was known as the "John F. Welch College of Business" until 2016, when it began using the name the "Jack Welch College of Business." Since September 2006, Welch has been teaching a class at the MIT Sloan School of Management to a hand-picked group of 30 MBA students with a demonstrated career interest in leadership. In December 2016, Welch joined a business forum assembled by then president-elect Donald Trump to provide strategic and policy advice on economic issues. In 2009, Welch founded the Jack Welch Management Institute (JWMI), a program at Chancellor University that offered an online executive MBA. The institute was acquired by Strayer University in 2011. Welch has been very actively involved with the curriculum, faculty and students since the beginning of the institution. JWMI's MBA program was recently named the number one most influential education brand on Linkedin and one of the top business schools to watch in 2016. The program has also been named one of the Top 25 Online MBA Programs two years in a row (2017 & 2018) by the Princeton Review for its excellence in five areas of selection criteria: academics, selectivity, faculty, technical platforms, and career outcomes. Its goal is not to make money, but to build over time focusing on the quality of the program and increasing the number of students enrolled year after year. At GE, Welch became known for his teaching and growing leaders. He has taught at MIT's Sloan School of Management and teaches seminars to CEOs all over the globe. "More than 35 CEOs at today's top companies [were] trained under Jack Welch". He demonstrates his passion for the institute by being highly involved with the students, faculty, and the development of the curriculum. JWMI students have direct access to Welch and he hosts quarterly video conferences with his students. It is known that along with his video conferences, Welch creates many video responses to messages on bulletin boards and answers individual emails. His investment in the university is also reflected in his interest in the institute's Net Promoter score (NPS). He administers surveys on satisfaction regularly and scrutinizes the results to find scores that need improvement. In an interview with Wired Academic, Welch explained the overall status of his MBA program, stating that the persistence rate of students continuing on to a second year had grown from 90% to 95%, and that JWMI turns away very few students in the admissions process. He also said that he would like better leadership training for MBA students. Welch had four children with his first wife, Carolyn. They divorced amicably in April 1987 after 28 years of marriage. His second wife, Jane Beasley, was a former mergers-and-acquisitions lawyer. She married Welch in April 1989, and they divorced in 2003. While Welch had crafted a prenuptial agreement, Beasley insisted on a ten-year time limit to its applicability, and thus she was able to leave the marriage reportedly with around $180 million. Welch's third wife, Suzy Wetlaufer (née Spring), co-authored his 2005 book Winning as Suzy Welch. She served briefly as the editor-in-chief of the Harvard Business Review. Welch's wife at the time, Jane Beasley, found out about an affair between Wetlaufer and Welch. Beasley informed the Review and Wetlaufer was forced to resign in early 2002 after admitting to the affair with Welch while preparing an interview with him for the magazine. Starting in January 2012, Welch and Suzy Welch wrote a biweekly column for Reuters and Fortune, which they both left on October 9, 2012, after an article critical of Welch and his GE career was published by Fortune. Welch identifies politically as a Republican. He has stated that global warming is "the attack on capitalism that socialism couldn't bring", and that it is a form of "mass neurosis". Yet, he has said that every business must embrace green products and green ways of doing business, "whether you believe in global warming or not...because the world wants these products". Regarding shareholder value, Welch said in a Financial Times interview on the global financial crisis of 2008–2009, "On the face of it, shareholder value is the dumbest idea in the world. Shareholder value is a result, not a strategy...your main constituencies are your employees, your customers and your products". Welch was widely criticized for his views on the job numbers from September 2012. After the Bureau of Labor Statistics released employment data stating that the U.S. unemployment rate had dropped from 8.1% to 7.8%, Welch tweeted, "Unbelievable jobs numbers...these Chicago guys will do anything...can't debate so change numbers". Welch stood by his tweet, stating if he could write it again, he would add question marks at the end to make it clear that his intention was to raise a question over the legitimacy of the numbers. A subsequent New York Post article on the employment data suggested manipulation of some of the survey responses by an individual employee in 2010, but that article was widely debunked, including the fact that the employee had not worked at the Bureau since 2011. No proof of the political manipulation of the job numbers from September 2012 has been presented. The Census Bureau later released a statement denying the possibility of systematic manipulation of the data. Still, in a Wall Street Journal opinion piece, Welch wrote that the debate led to people looking at unemployment data more carefully and skeptically. Referencing his original tweet, he stated "Thank God I did", in a Squawk Box appearance, and also wrote, "The coming election is too important to be decided on a number. Especially when that number seems so wrong". Jack Welch instilled an organizational behavior that he called "boundaryless". He called such a company, a "boundaryless company". He defined it as, removing the barriers between traditional functions, and finding great ideas, anywhere within the organization, or from outside the organization, and sharing them with everyone in the company. General Electric under CEO Jeff Immelt has realigned itself becoming more specialized, cutting off ties with older businesses, and is now more focused on services in finance, health care, and aircraft engines. An article from The New York Times highlights the fact that General Electric after the era of Jack Welch is more focused on core businesses after a spin-off of its North America retail finance business. After selling a fraction of its business, Immelt planned to use the proceeds to build the capital as a "standalone company", resulting in "a boost for shareholders". On March 11, 2010, Welch cameoed as himself in the NBC sitcom 30 Rock, appearing in the season four episode "Future Husband". In the episode, Welch confronts Alec Baldwin's character, Jack Donaghy, to confirm the sale of NBC Universal to a fictional Philadelphia-based cable company called Kabletown. The sale is a satirical reference to the real-world acquisition of NBCUniversal from General Electric by Comcast in November 2009. ^ "Jack Welch: 'I Fell In Love'". CBS News. ^ Storrs, Francis (March 2006). "The 50 Wealthiest Bostonians". Boston Magazine. Retrieved October 3, 2008. ^ Green, Jeff (June 6, 2013). "Jumbo Severance Packages for Top CEOs Are Growing". Business Week. Retrieved July 10, 2014. ^ CNN Library (December 27, 2012). "Jack Welch Fast Facts - CNN.com". CNN. ^ a b c d Borjas, Thomas. "Jack Welch 1935". Retrieved October 2, 2014. ^ "Past Leaders". Retrieved May 14, 2014. "Past Leaders". Retrieved May 14, 2014. ^ a b c d "How Jack Welch Runs GE". Businessweek.com. May 28, 1998. Retrieved July 12, 2010. ^ "Failure 101: A class students could use". New York City: MSNBC. November 5, 2009. Retrieved November 9, 2009. ^ Welch, Jack; Byrne, John. A. (2001). Jack: Straight from the gut. New York: Warner. ISBN 0446690686. ^ "Jack Welch - Manager of the Century". Anti Essays. Retrieved September 29, 2014. ^ a b "John F. Welch, Jr". GE website. ^ "Jack Welch's Encore". Businessweek.com. June 14, 1997. Archived from the original on January 1, 2010. Retrieved July 12, 2010. ^ Cohan, Peter. "Why Stack Ranking Worked Better at GE Than Microsoft". Forbes. Retrieved October 2, 2014. ^ "Jack Welch" (PDF). Advanced Business English. Archived from the original (PDF) on March 15, 2016. ^ "Neutron Jack". Business Week. Retrieved October 2, 2014. ^ Richter, Paul. "General Electric Will Buy RCA for $6.28 Billion". LA Times. Retrieved October 2, 2014. ^ "FORTUNE – GE's Jack Welch Named Manager of the Century – November 01, 1999". Time Warner. April 26, 1999. Retrieved July 12, 2010. ^ Hall-Ellis, Sylvia D. "Succession Planning and Staff Development - a Winning Combination." The Bottom Line, vol. 28, no. 3, May 2015, pp. 95-98. ^ Welch, Jack, and John A. Byrne. Jack: Straight from the Gut. Warner Books, New York, 2001. ^ "'Hardball with Chris Matthews' for July 12, 2006". MSNBC. July 13, 2006. Retrieved July 12, 2010. ^ O'Boyle, Thomas F. (1998). At any cost : Jack Welch, General Electric, and the pursuit of profit (1. ed.). New York: Knopf. p. 456. ISBN 0-679-42132-7. ^ a b Gow, David (September 17, 2002). "SEC inquiry as Jack Welch gives up freebies". The Guardian. London. ^ Mark Lewis (September 16, 2002). "Welch Walks Away From Perks". Forbes. Retrieved July 23, 2012. ^ a b Rebecca Leung. "Jack Welch: 'I Fell In Love'". February 11, 2009. Retrieved April 3, 2012. ^ a b Rachel Layne; John Lauerman (August 4, 2009). "Former GE Chief Jack Welch Expects Full Recovery From Discitis". Bloomberg. Retrieved May 23, 2012. ^ a b c Landon Thomas Jr. (November 2, 2006). "On the Road With Jack and Suzy". The New York Times. Retrieved May 23, 2012. ^ Keith J. Kelly (November 13, 2009). "Jack Welch ends BusinessWeek column". New York Post. Retrieved May 23, 2012. ^ Zefram Cochran (September 2004). "When Jack Welch Was Deputy Director for Intelligence: Remembering an Imagined DDI". Retrieved May 31, 2013. ^ "Jack Welch". WSJ.com. Archived from the original on June 24, 2009. Retrieved May 25, 2012. 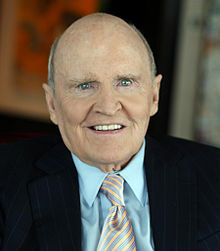 ^ "Sacred Heart University Names College of Business for Legendary GE Chairman Jack Welch". Sacredheart.edu. Archived from the original on August 5, 2012. Retrieved July 12, 2010. ^ "Jack Welch on the executive MBA he created in his own image". Mitsloan.mit.edu. March 9, 2006. Retrieved July 12, 2010. ^ Bryan, Bob (December 2, 2016). "Trump is forming an economic advisory team with the CEOs of Disney, General Motors, JPMorgan, and more". Business Insider. Retrieved June 1, 2017. ^ Melissa Korn (November 11, 2011). "Welch to Move School Out of Chancellor University". Wall Street Journal. Retrieved March 15, 2012. ^ Geoff Gloeckler (June 22, 2009). "Jack Welch Launches Online MBA". Bloomberg Businessweek. Retrieved March 15, 2012. ^ "Jack's Involvement in the Jack Welch MBA". Jack Welch Management Institute. Retrieved January 25, 2016. ^ Haden, Jeff. "Jack Welch Reveals the 1 Quality Every Great Leader Possesses". INC.com. INC.com. Retrieved August 12, 2016. ^ SCHMITT, JEFF. "10 Business Schools To Watch In 2016". Poets and Quants. Poets and Quants. Retrieved August 12, 2016. ^ Gloeckler, Geoff. "Jack Welch Launches Online MBA". Bloomberg Businessweeek. Education Business. Retrieved September 24, 2014. ^ a b "Jack Welch Online MBA Program". Strayer University. Strayer University. Retrieved September 30, 2014. ^ Glader, Paul. "Exclusive: Management Guru Jack Welch Talks About Digital Education, Online MBAs & Modern CEOs With WA". wiredacademic. Archived from the original on March 15, 2012. Retrieved September 14, 2014. ^ Bertaccini, Donna (November 8, 2004). "Lovers seek lawyers as divorce booms". BBC News. Retrieved July 12, 2010. ^ Kolhatkar, Sheelah (April 19, 2004). "Suzy Wetlaufer Preparing To Be 'Neutron Jackie'". Retrieved November 8, 2014. ^ Jon Bershad (January 27, 2012). "Jack Welch: The GOP Needs To Be Nice To Ron Paul When He Drops Out Because They Need His Followers". Mediaite. Retrieved May 23, 2012. ^ "John F. Welch". Women in the Economy: An Executive Task Force. The Wall Street Journal. April 30 – May 2, 2012. Retrieved May 25, 2012. ^ Tim Sprinkle (October 9, 2012). "Jack Welch Takes His Column and Goes Home". Yahoo News. Retrieved October 9, 2012. ^ kimball, Joe. "Former GE Chairman Jack Welch on CNN says he likes Pawlenty". Retrieved September 25, 2014. ^ MSNBC: Morning Joe. July 2, 2008. ^ "Fresh Dialogues Interview with Alison van Diggelen, May 2009". Freshdialogues.com. May 12, 2009. Retrieved July 12, 2010. ^ Guerrera, Francesco (March 12, 2009). "Welch rues short-term profit 'obsession'". Financial Times. Retrieved March 12, 2009. ^ Schlesinger, Jill (October 9, 2012). "Is Neutron Jack Welch not so tough after all?". CBSNews. Retrieved September 25, 2014. ^ Malone, Scott. "Jack Welch sets Twitter ablaze with Obama job jab". Chicago Tribune. Retrieved October 6, 2012. ^ a b Welch, Jack (October 11, 2014). "I Was Right About That Strange Jobs Report". Retrieved September 14, 2014. ^ Crudele, John (November 19, 2013). "Census 'faked' 2012 election jobs report". New York Post. Retrieved August 31, 2017. ^ Gongloff, Mark (November 19, 2013). "No, Obama Did Not Fake The Unemployment Rate". Huffington Post. Retrieved August 31, 2017. ^ Bureau, US Census. "Census Bureau Statement on Collection of Survey Data". The United States Census Bureau. Retrieved August 31, 2017. ^ Bradford, Harry. "Jack Welch On CNBC: 'Thank God' I Questioned The Jobs Numbers (VIDEO)". Huffington Post. Retrieved September 14, 2014. ^ "The New Boundaries of the "Boundaryless" Company". Harvard Business Review. ^ a b Bhasin, Kim. "GE is Abandoning Jack Welch's Old Management Philosophy". Business Insider. Retrieved October 1, 2014. ^ Currie, Antony. "General Electric Finally Gets Past the Jack Welch Era". The New York Times. Retrieved September 14, 2014.